If the old "it takes all kinds" addage is true, you're sure to find everything you need in Antibes Juan-les-Pins. Located at the real heart of the Côte d’Azur between Nice and Cannes, Picasso’s favorite town of Antibes has become one of the most popular destinations on the French coast. Twinned with the neighborhood of Juan-Les-Pins (hence often referred to as ‘Antibes-Juan-Les-Pins’), there are some truly luxurious properties here, both along the seafront – particularly on Cap d’Antibes, the pine-clad promontory jutting out into the sea – and in the residential areas. Throughout the year the city hosts a vibrant calendar of events, the highlight of which is the international jazz festival Jazz à Juan, held in July in a pine grove (pinède) overlooking the sea, held next from July 12th to 21st, 2019. Ray Charles and Miles Davis made their European debut here and today the festival welcomes stars such as Diana Krall and Marcus Miller. To fully appreciate the wealth that Antibes attracts, take a walk around Port Vauban (the Mediterranean’s largest marina in terms of total boat tonnage) and out to the Quai des Milliardaires, where the world’s most luxurious private yachts are moored in all their glory. A mooring here can cost up to €1.5m and it’s always interesting to make a note of the yachts’ names to look up their owners and next destinations! Stroll around Fort Carré, which immortalises prestigious episodes in Antibes’ history, and the terrace of Bastion Saint-Jaume, from which Jaume Plensa’s 8m-high sculpture Nomade looks out to sea. Picasso: "Give me a museum, and I'll fill it." Don’t miss the Musée Picasso, formerly the Château Grimaldi, built upon the foundations of the ancient Greek town of Antipolis. The château was Picasso’s studio in 1946 and now houses a fascinating collection of his paintings, drawings, lithographs and ceramics, as well as photographs of the artist. At the start of the 1940s, Picasso accepted a proposal to set up shop in one of the rooms of the château. He spent six months painting there, leaving the museum almost completely full. Thus was born the first museum dedicated to an artist while he was still alive, on the sole condition that his works could never leave and be transfered elsewhere. One of the Grimaldi's rooms is dedicated to another contemporary painter, Nicolas de Staël, who stayed in Antibes during one of his most creative periods. Similarly, the acquisition of several contemporary works - by Léger, Atlan, Magnelli, Ernst, Picabia, Modigliani, Pagès, and Hans Hartung, another Antibois by adoption) - contribute to the museum's world-renowned reputation. Depart from the Antibes Tourist Office, 42 avenue Robert Soleau, and step back in time. During this walking tour, you will discover the fascinating history of Antibes, a city created by the Greeks and developed by the Romans, ravaged by the Barbarians, then fortified under the reign of Henri IV and Louis XIV. 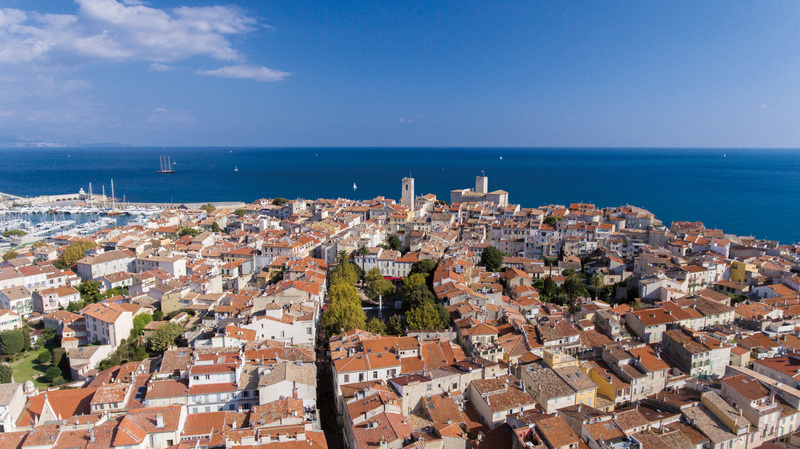 Enjoy the beauty of its medieval town, its ramparts along the seafront, the Provencal market, the famous Port Vauban, and the flowery Safranier neighborhood. Aéroport International Nice-Cote d’Azur, à 17 km d’Antibes Juan-les-Pins. By car: Autoroute A8, la Provençale, exit 44. Direction Antibes Centre, then Juan-les-Pins.